This dish called Ikan Pepes is a whole fish cooked in a spicy curry and tamarind sauce. 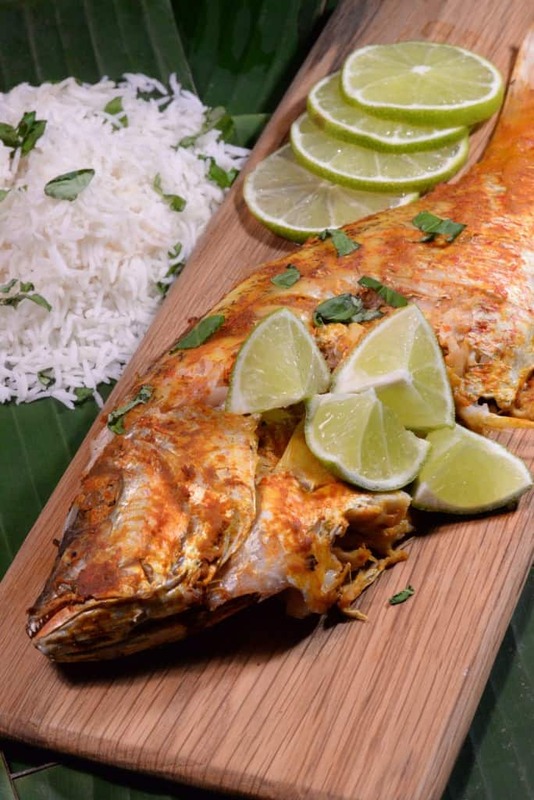 The fish is first steamed in a banana leaf and then grilled for that wonderful smoky flavor that only a grill can provide. Cooking a whole fish with the head on can be a little intimidating at first, but once over it, you can savor it as it is mighty tasty!. Serve with some white rice for a lovely East Timorese meal. 1 Tablespoon tamarind pulp, soaked 5 minutes. Score the fish several times and marinate it with salt and lime rubbed into the surface. Rinse the banana leaves and place about ⅓ of the curry in the bottom of the sheet of banana leaf. Rub about ⅓ of the curry into the belly of the fish. Ladle the remaining ⅓ of the curry over the fish and seal up the “packet”. Use soaked string as necessary to seal the packet. Unwrap the packet and serve over rice with chopped basil.